With Vash the Stampede's brother Knives' power growing exponentially and the shattered wreckage of Earth's spacefleet littering the planet Gunsmoke, Vash must lay everything on the line to prevent the apocalypse his crazed brother is determined to deliver! Holding nothing back, Vash goes toe-to-toe with Knives in a final cataclysmic confrontation, with the future of humanity and his home planet hanging in the balance. 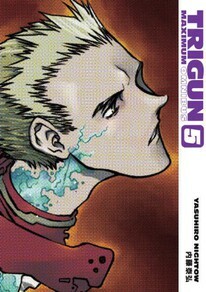 Collects volumes 13-14 in omnibus format.